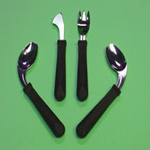 UBend It™ Bendable Utensils are the perfect cutlery solution for people with upper extremity weakness or reduced range of motion. 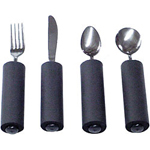 These special utensils allow the user to bend it in a left or right angle for a more controlled and comfortable position, reducing the strain on the wrist. Ideal for individuals with arthritis, stiff wrists and elbows, recovering from a stroke or experience other limitations. The built-up handle is made of a contoured and textured, hard sturdy plastic, making it very comfortable and easy to grasp. 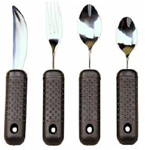 The utensils are made from stainless steel for a long lasting shine and durability. Use the tab on the end of the handle to attach a wrist strap. Top rack dishwasher safe. Available in a fork or tablespoon with either a right angle, left angle, or straight. 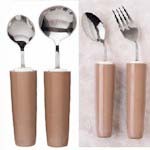 Each sold separately and as a fork and spoon set. 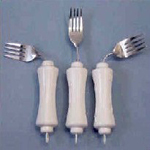 These utensils are designed for elderly people and people who have difficulty moving their hand or wrist due to arthritis, stroke, brain injury or other physical limitations. 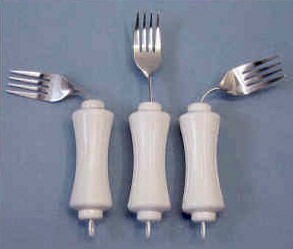 The Touch Twist Utensils makes it easier for individuals with limited hand and wrist flexibility to dine independently.